Yes it’s true, the Tres Leches cake has been veganized! How can this be possible you ask? Three milks and the best vanilla cake recipe laced with a pinch of nutmeg and cinnamon too! This simple little cake is full of complex flavors you won’t believe just how easy it is! For me this cake is best served super cold and a day after it’s been prepared to let all the flavors meld together. 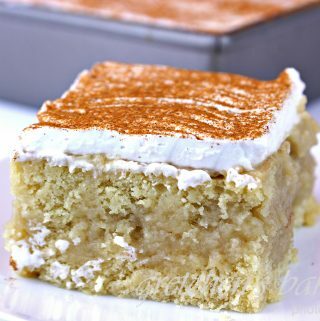 So if you are someone who loves (loved) cake dunked in milk, this Vegan Tres Leches Cake is for you! You can have your cake and drink it too! 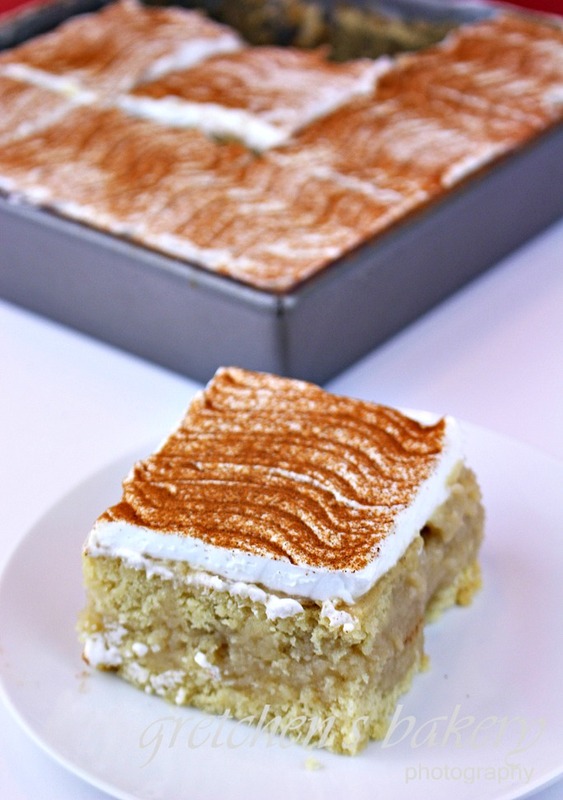 Tres leches is typically served casserole style, so I just serve it right out of the cake pan. For a nicer presentation you may want to opt for a glass baking dish instead. Of course many people will make this cake into cake layers for layering into a fully iced cake so it is your option what you want to bake it into. Due to the added baking powder in the homemade egg replacer I made out of cornstarch, oil, water and baking powder in combination with using canned aquafaba will impart a considerable amount of salt into the recipe. 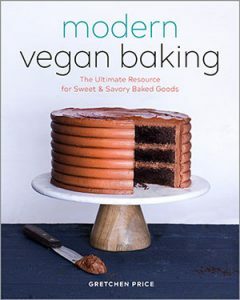 Which is why there is no added salt in the cake recipe below, and I also recommend boiling dry chickpeas to get your aquafaba rather than using canned to eliminate added salt. incorporated and you have a stiff peaked glossy meringue. oil (or melted vegan butter) and vanilla extract, whisk smooth, reserve. the touch when you gently press the center or when a toothpick inserted comes out clean. Cool for about 15 minutes then poke holes into the cake and pour the milk mixture over the entire cake to soak in. Combine the can of coconut milk with the almond milk, nutmeg and sugar and bring to a boil. Once it boils reduce the heat and let it simmer stirring often for about 20 minutes or until it is thicker and makes a slight glaze covering the back of your spoon. Remove from the heat and cool to warm, them pour over the warm cake. Refrigerate the cake for at least 2 hours or overnight (I prefer overnight) then ice with coconut whipped cream. Open the refrigerated can of coconut milk and skim the fat off the top (reserve the coconut water for another recipe or a smoothie) and place the fat in a mixer bowl with the sifted confectioners sugar. Store tres leches cake in the refrigerator at all times and serve cold. If I were to make this cake using eggs, how many eggs would I need? My daughter is dairy free, so I am happy I can make this cake for her. Hi Gretchen, having a problem accessing your other website.I am getting a certification error. Is your site closed down? HI Lisa, having some techinical errors and it seemed to happen while I was in Florida visiting my mom ( I just got back today) looking into it now thanks! Hey Gretchen, love your site! I was just wondering what you do with all the left over chickpeas? I’m hesitant to really start working with Aquafaba a lot because I am not sure what to do with all those chickpeas! Thank you in advance for your time. I have just gotten some chickpea powder that is just like meringue powder, I have 2 brands. Ill be doing a review video comparing the two against regular AF from chickpea liquid so stay tuned for that video. I have to do the testing first though so it may be about a week or so before I get it all done. 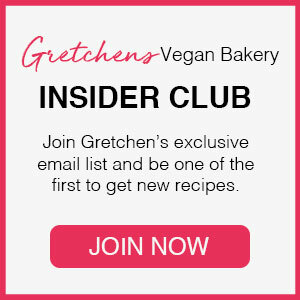 Hi Gretchen, does the cake have to stay in its baking dish after soaking overnight? Will it hold it’s shape if I were to remove it from the dish, layer them and fully ice it? Could you make combine this recipe and the non-vegan one? I want to use the sponge cake of the non-vegan recipe but the milk mixture of this one! Let me know if that would work, excited to try it! Is pastry floor the same as cake flour? Does the AF have to be reduced or is straight from the can k? I’m in a rush and can’t cook the chickpeas from scratch this time unfortunately. AF from the can is fine no reduction needed. I was wondering where the coconut cream comes in or if it comes in at all?